Congrats to the entrants of this small Storytelling-themed event! The jam results are out, making me realize in the process that I shoud have advertised the voting phase more: due to a lack of ratings, only 2 of the games ended in the final rankings ( @bradur 's only had 1 vote). The 3rd Kajam focused on storytelling just reached its end, yielding 4 new games for all to discover! For the next week, everyone will be able to rate the games, so that everyone can get enough ratings for interesting results. Go explore them, and please leave feedback on the games you play! Because games don't always have to be about shooting things, the first 2018 Kajam is about telling Stories! Explore how to tell a nice and engaging story to your players, maybe by focusing on developing interesting choices, or on the attachment to the characters, or simply use this excuse to finally try and tell a story for your first time! Walking simulators, either in 2D or 3D. Jan. 1st - Jan. 28th: The jam. Make a small game while focusing on its story elements. Either over an evening or spanning the whole 3/4 weeks, either solo or as a team, there's little to no rules, just a chance to practice. If you're curious though, feel free to check the event rules. Jan. 28th - Feb. 4th: The rating phase. For one week, all entrants will rate the storytelling of the other games. Like on the first event: no Overall ratings, it's all about how much you liked the stories. Feb. 4th: Results are released! Don't forget to share tips & progress reports with the community throughout the month. Have fun! The 24 days of the 2nd Kajam, focusing on Sound Effects, have passed by. Congrats to the entrants! Due to the low entry count, we have decided to bypass the voting phase and just end the jam as is. Everyone is a winner! We're leaving entry submissions open throughout the end of the month for any late entrant. Until the next jam, go check the submitted games and make sure to leave a comment on them! After a week of voting, the results of the first monthly competition are out! Congratulations to the podium ;) And thanks to all who took part in playing & reviewing the games. The next Kajam will start this Friday evening (7pm UTC), i.e. on December 1st. Our first guest host will be @dollarone, announcing the theme once again as the event launches. See you this week-end! Congrats to all the entrants of the 1st Kajam! This first event proved to be intimate with just 4 entries. I hope that even those of you who could not complete their games in time still had fun, and maybe learnt about game feel in the process! I've left the submission form open for late entrants. The results of the tiny competition will be revealed this Sunday, 7pm UTC as usual. The Kajam month-long event series continues, with @dollarone being the planned host for the next event. Just like the first event was focused on Game juice, the next one will be targeting a different aspect of game development chosen by its host. It will be announced on December 1st. Dec. 1st - 24th: The jam. You'll have around one month to work on a game and submit your entry! (see also the event rules). Note: You are allowed to submit your in-progress entry to let people know you are entering, then edit the page later. Dec. 25th - 31st: The rating phase. For one week, all entrants will rate the other games according to the topic of the month (to be announced). Stay tuned through Twitter or Reddit to be reminded of the event launch! The last few days have been quite productive! I've been joined by @YO0oo0OY on sound design, who already sent cool assets. With particles, screenshakes, short flashes and tight sounds, the game already feels rather juicy! For my Kajam entry, I have decided to go with a top-down, twin-stick shooter. That should give me plenty of opportunities for finetuning the game feel and juicing up the action! For my last MiniLD entry I tried the exercise of making a whole game design document before coding the game. Even if the actual game was quite small, it was fun writing the doc, and I think it helped keep the development focused and the end result consistent. 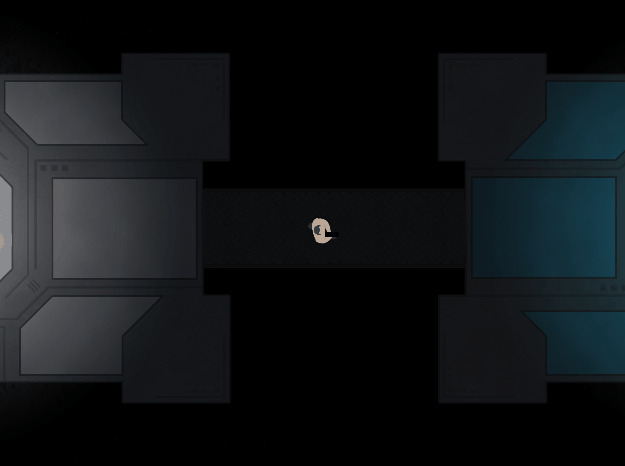 Game set in a strange, futuristic place that feels like a maze made out of hundreds of similar rooms arranged as a grid, with straight corridors in-between them. Top-down view with either a pixel-art style (like Hotline Miami except simpler), or a smoother look with simplistic art like Prison Architect. In both cases it will be simple and in full 2D. The room locks up and something happens randomly: you get loot, or robot enemies appear. Maybe both. Maybe nothing. Kill the enemies until there is none. (Optional) You see a clue about where the exit of the maze is. You pick one of the 4 directions, enter a corridor to the next room.